This is the highest specification Lamborghini Aventador in the world. What you’re looking at here is the last ever Lamborghini Aventador SV to roll off the production line in Sant'Agata Bolognese to make way for the Aventador S. Lamborghini Edinburgh had the privilege of ordering the 600th SuperVeloce for a client who wanted to stand out from the crowd. 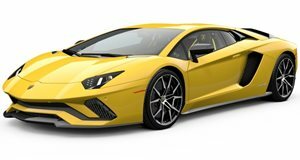 According to the dealer, it represents the highest specification Aventador SV in the world – and it’s easy to see why. The bespoke supercar is finished in a unique paint job mimicking the Porsche 918 Spyder's Liquid Metal Blue. As part of the intricate 12-stage process, all areas of the aggressive exterior that are usually black or exposed carbon on the Italian supercar were also painted in the Liquid Metal shade to give it a unique look like no other Aventador SV. Two-tone gold wheels complement the bespoke paint job applied to the V12-powered Lambo. “We were hugely honored to have been given the opportunity to create such a bespoke car,” the dealership wrote on Facebook. “Quite literally, months of work have gone into perfecting the spec.” Apparently, it took “many hours of phone calls, many trips to Italy and many nights working late” to create the bespoke Aventador SV. The finished result is an acquired taste, but it’s undeniably a special send off for the 750-hp supercar that will no doubt become a highly desirable collectors car in the future.